In order to cheer myself up and get myself thinking about the future I thought I’d make a list if the things I won’t miss about work. Strangely, they’re all to do with the office environment. I’ve said it before but I’ll say it again: I love my job so I don’t have much to moan about on that front but bring on working at home! Being freezing cold all winter and trying to work out the daily ‘smart but warm’ conundrum of what to wear to the office. 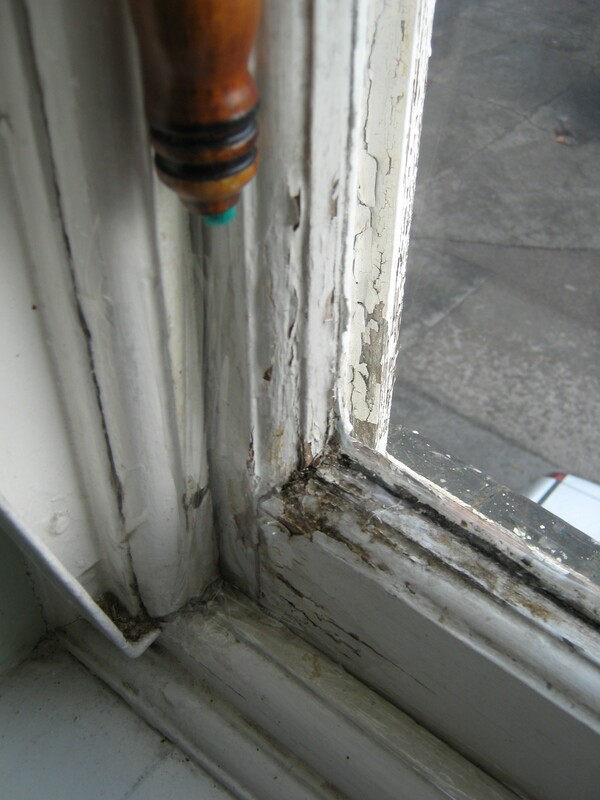 Sellotaping up with window frames every winter so they don’t rattle menacingly and let in gales of frigid air. For those who don’t believe me, here’s the photographic evidence. Trying to do a professional job from a computer that only runs Windows 2000 which means that most documents sent to me are incompatible and vice versa. And broadband that’s so slow it should be in a museum. The hole in the ceiling that lets in water every time it rains. 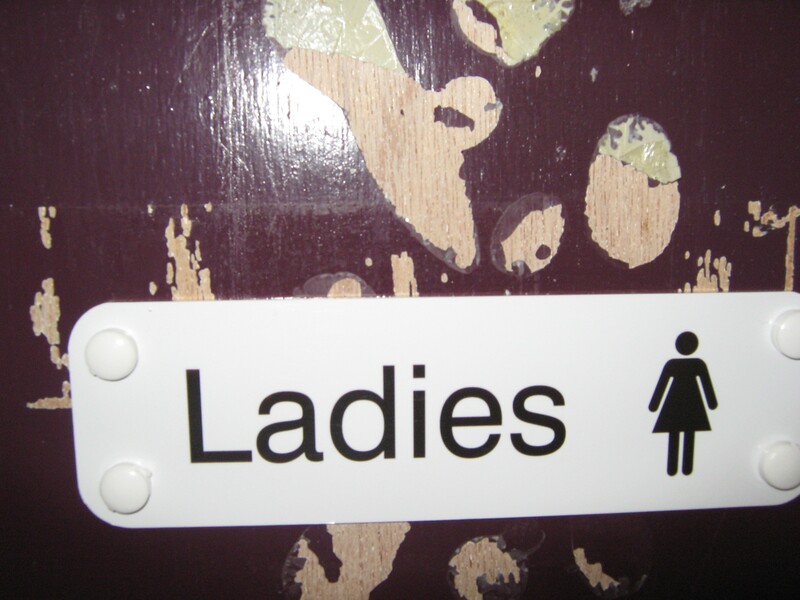 The ladies loo. Cold, cold, cold and hideous. Unless you are a woman who works in this office you will not recognise this photo but I’d like the blogosphere to know it’s not all soft furnishings and pot plants in the public sector. The canteen. Responsible for: heavy handed garlic powdering of every hot dish they make; inability to make a cheese ‘n’ pickle toastie without a) burning it or b) forgetting to switch on the toasting machine and not noticing for twenty minutes; not knowing the price of any of their products ever and having to dash around for ten minutes and find someone who does by which time your food is cold; charging ridiculous prices for a piece of spot-addled fruit; making sandwiches with month-old bread and being all surprised when you point out that the bread is so hard it could be used by the Olympic curling team for not only kettles and brushes but for the ice-rink itself . And that mould is not a tasty additional filling. Under any circumstances. The mess. I’m a bit of a neat freak so every time my neighbour’s Mount Crapius starts leaning dangerously over my desk I get palpitations. Luckily my computer monitor is so huge (see point one) it blocks most of the view. And indeed most of the desk surface. The person in the office across the hallway whose shrieking laugh makes me jump off my chair several times a day. She sounds like the mad woman in the attic. Perhaps she is. What I will miss though is the companionship of my colleagues. They’re always really supportive when you need them and we work hard but have fun too. There are four of us in the room today and we’ve just held a game of guess the intro to naff eighties songs. I’m afraid I guessed almost all of them. I’ll miss this once it’s gone. We got you a new sign but oops! we forgot to paint the door first.